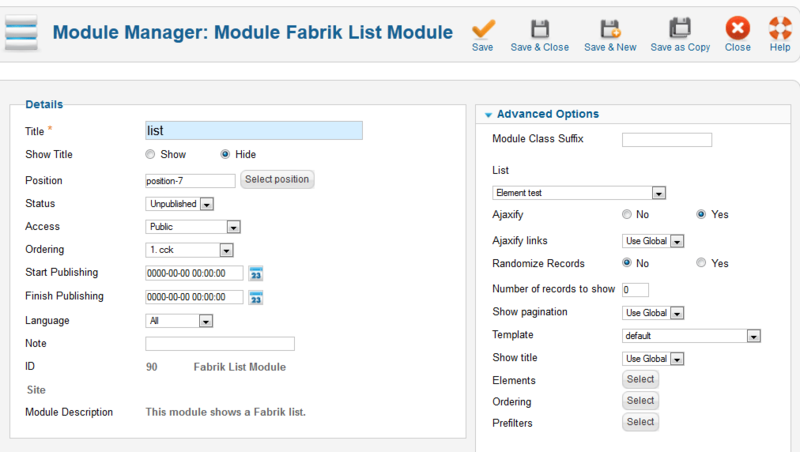 This module allows you to displays a list in the selected module position. Ajaxify - If set to yes, navigation, grouping and filtering occurs via ajax, keeping the user on the current page. If set to no then these actions wll reload the page. Ajaxify links- If no selected and you click on a link in the module to add or edit a record browser is redirected to a Fabrik component page showing this form. If yes is selected Fabrik loads the form via Ajax and submission of the form takes place via Ajax, meaning your browser rests on the current page. Template - The template to use to render the module, if left blank this will revert to the template selected for the table when creating it in Fabrik. Show title - Should the module show the list title. If set to 'Use global' then uses the list's 'show title' option. Otherwise yes/no will override the list's setting. Ordering - Opens a popup where you can select an alternative ordering to that defined in the selected list. Prefilters - Opens a popup where you can override the list's default prefilters.